Qian, R.J., et al. Intracranial Multiple Sites Recurrence and Extracranial Multiple Organs Metastasis of Intracranial Hemangiopericytoma. (2017) J Anesth Surg 4(2): 108-110. © 2017 Qian, R.J. This is an Open access article distributed under the terms of Creative Commons Attribution 4.0 International License. Purpose: As a rare and vascularized tumor, Intracranial hemangiopericytoma (HPC) has the significant clinical characters of local recurrence and distant metastasis including intracranial and extracrainal. The treatment of primary and metastatic tumor is still a challenging. Methods and Results: A case of intrancranical HPC was presented with Intracranial multiple sites recurrence or metastasis and Extracranial multiple organs metastasis including bilateral lungs, liver, bilateral kidneys, costal bone, spine, centrums, pancreas and pelvic cavity in a 32-year-old male, which received multiple surgery and radiation therapy, chemotherapy and biotherapy, and died 8 years after followed up. Conclusions: The most important treatment for intracranial HPC is to excise tumor completely as possible as and following radiation therapy. Especially, to intra and extra cranial multiple metastasis, Gamma knife and Cyber knife may be the affected way besides of reoperation. Intracranial hemangiopericytoma (HPC) is rare relatively and malignant tumor in central nervous system, accounting for only 0.5% - 1% of all intracranial tumors, found more in young and middle-aged men than in women. The best treatment of tumor usually is microsurgical. The tumor has higher local recurrence rate and can metastasize to extracranial organs. We report the case of HPC with intracranial multiple sites recurrence or metastasis and extracranial multiple organs metastasis including bilateral lungs, liver, bilateral kidneys, costal bone, spine, centrums, pancreas and pelvic cavity 5 years after the intracranial tumor was surgically excised. The patient received cerebral, spinal and renal surgery, multiple radiotherapy, chemotherapy and biotherapy, was followed up more than 8 years from the first operation to dead at last. To our knowledge this was the second case with metastasis to bilateral kidneys. The data of photographs, surgical, radiotherapy, chemotherapy, biotherapy and follow-up from the case were summarized. A 32-year-old male who presented with 3-months history of headache, dizziness and left ear-ring in September 2006, was diagnosed as tentorial meningioma according to Magnetic Resonance Image (MRI), and received the transcranial approach surgery of tentorial meningioma. The tumor was observed be based on the tentorium of cerebellum and left petrosum, was excised to Simpson level II during operation. As hemangiopericytomas was confirmed by postoperative pathology, Intensitymodulated radiation therapy (IMRT) performed at location of intracranial lesion within 4 weeks after operation, with 60 Gy dose for 6 weeks. The patient was followed-up persistently till June 2011, found multiple intracranial tumors including the initial sites (Figure 1A), right renal mass, T9 intra spinal tumor and multiple lung lesions (Figure 1B) from MRI because of headache and lower back pain. The right kidney tumor was resected in another senior hospital by laparoscope and postoperative immunohistochemical pathology reported metastatic hemangiopericytoma with CD34[+], CD99[+], CD31[-], Vimentin[+], Bcl-2[+], EMA[-], CK[-]. Intracranial multiple tumors received Gamma knife radiotherapy in July 2011 and T9 spinal tumor surgery in our hospital in August 2011 with postoperative immunohistochemical pathology: metastatic Hemangiopericytomas with CD34[+], CD99[±], Vimentin[+], Bcl-2[+], EMA[-], S-100[-], GFAP[-], CK[-], Ki67[10 % +]. After that, the patient was treated six courses of chemotherapy with oral 150 mg/m2 temozolomide on days 1 – 7 and 5 mg/kg bevacizumab intravenously on days 1 and 14, repeated at 14-day intervals, The patient continued to be followed up, presented the symptoms of swallowing difficulty and double visual image till March 2013. MRI of head revealed that the tumor in the front of brain stem significantly enlarged (Figure 1C), and Cyber Knife treatment was underwent to intracranial multiple tumors. The ventral tumor of brain stem became smaller (Figure 1D), but MRI showed that T9 spinal tumor recurred and T5 centrum tumor (Figure 1E) and left renal mass (Figure 1F) appeared in December 2013. The second surgery of T9 spinal tumor was performed in our hospital, and then Cyber Knife treatment was done again after assessed completely. From January to August 2014, 8 courses of cytokine-induced killer (CIK) treatment were performed, and then patient obtained stable disease condition, continued to be followed up at oncology department till he died quickly because of failure of multiple organs in December 2014. The total follow-up term is 99 months. 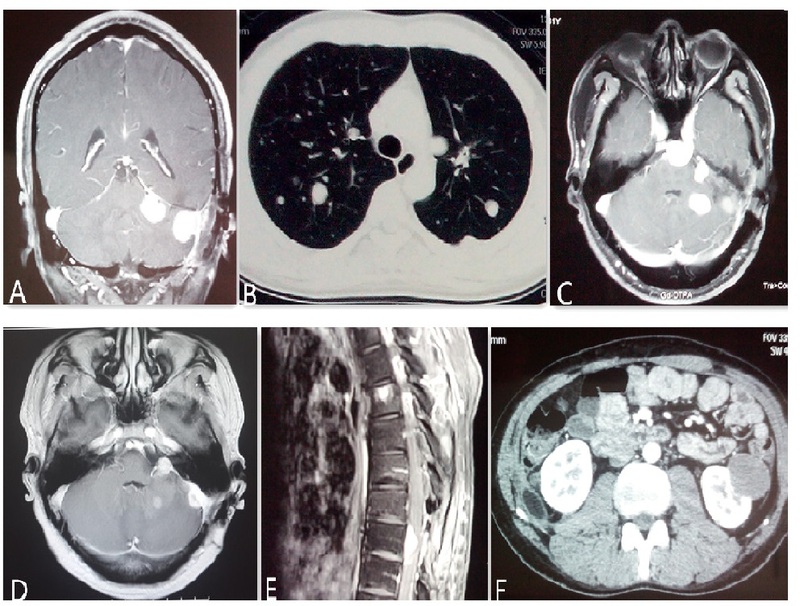 Figure 1: A, B: intracranial multiple metastatic hemangiopericytomas, bilateral lung and costal bone multiple metastatic tumors. C, D: intracranial metastatic tumor in front of the brain stem becomes smaller obviously after Cyber knife treatment. E: T9 spinal canal metastatic hemangiopericytoma recurrence and T5 centrum metastatic tumor. F: left kidney and pancreatic metastatic hemangiopericytoma. Intracranial HPC is rare relatively, more aggressive biology tumor, has a high recurrent rate and high metastasis rate. The first challenging of physician is to distinguish HPC from meningioma. Though MRI and CT can provide the important diagnostic clues of this tumor, which include the clear margin, high density, significant contrast image in CT, lobulated or mushroom nodule and signal voids of vessel image in MRI, it is considerable difficult to get the exact preoperative diagnosis of HPC with shortage of biopsy. Clinically, shorter clinical course, faster growth rate and younger occurring age are the most feature of HPC, but the tumor is still misdiagnosed as meningioma easily. In the present case, HPC was misdiagnosed preoperatively. At the present study, the complete excision of intracranial HPC followed by postoperative radiotherapy was regarded as the most important treatment. Extracranial metastasis is common in HPC of high-grade pathology. Aggressive treatment is recommended not only for intracranial tumor but also for possible extracranial metastases. So surgery would be the first choice for the first recurrence of HPC, then following radiotherapy. The recurrent rate of total removal of tumor is 38% compared with 84% of part removal 5 years after surgery. The overall survival(OS) of total removal of tumor is 13 years compared with 9.75 years of part removal, and OS will extend to 18.6 years when total removal of tumor with the addition of postoperative radiotherapy. There are another reports that postoperative radiotherapy is effective in local-recurrence control (LC)[7,8], specially despite of the degree of resection. No development of intracranial HPC persists to 5 years after first operation and postoperative radiotherapy, similar to another case report with extracranial multiple organs metastasis. Cyber knife, compared with Intensity-modulated radiation therapy and Gamma knife radiotherapy, may be reveal dramatic effect in controlling development of intracranial metastatic HPC in present case, and prompts the potential application prospect in treatment of HPC. Besides of radiotherapy, chemotherapy may be play a supplementary role in controlling development of HPC with distant multiple organs metastasis although effect of it remains controversial because of limited clinical studies. Temozolomide and bevacizumab, used mostly in treatment of recurrent glioma, were found the other activity function against many types of tumors, and were applied for eight cycles through a reinforcing programme in the case when tumor disseminated and got a long term immobile clinical manifestations. Anti-angiogenic agents, another kind of novel drugs such as sunitinib and pazopanib, have been also utilized to treated to this disease. For multiple organs metastasis of intracranial HPC, CIK therapy may be a potential treatment because of the resembling Immuno-histochemical features of different organs metastatic tumor from HPC. The Immuno-histochemical results from renal and spinal metastatic tumor in the present case are similar, and CIK therapy appears stable effect for almost 12 months. Through preoperative CT and MRI can provide a few useful diagnostic evidences, to distinguish intracranial HPC from meningioma only depends on the pathological characteristics. From the case, it is known that the most important step of treatment for intracranial HPC is to excise tumor as completely as possible. The postoperative radiation therapy, which can delays the recurrence of tumor, also plays an important role in treatment. The treatment of metastatic HPC still maintains a big challenge, especially to intra and extra cranial distant multiple organs metastasis. Repeated surgery is still the first choice. Radiation therapy such as Gamma knife and Cyber knife, which should be paid attention to, are helpful supplement treatment in addition to re-surgery. CIK treatment is another potential way to control multiple organs metastatic tumors when no chance to re-surgery, which should be further investigated in future. Written informed consent was obtained from the patient’s relative for publication of this report. 1. Suzuki, S., Wanifuchi, H., Shimizu, T., et al. Hemangiopericytoma in the lateral ventricle. (2009) J Neurol Med Chir (Tokyo) 49(11): 520-523. 2. Vuorinen, V., Sallinen, P., Haapasalo, H., et al. Outcome of 31 intracranial hemangiopericytomas: poor predictive value of cell proliferation indices. (1996) Acta Neurochir (Wien) 138(12): 1399-1408. 3. Kim, B.S., Kong, D.S., Seol, H.J., et al. Gamma knife radiosurgery for residual or recurrent intracranial hemangiopericytomas. (2017) J Clin Neurosci 35: 35-34. 4. Wang, W., Zhang, G.J., Zhang, L.W., et al. Long-term outcome and prognostic factors following repeated surgeries for intracranial haemangiopericytomas. (2017) World Neurosurg (17): 31324. 5. Hirose, Y., Sagoh, M., Hayashi, T., et al. Hemangiopericytoma arising at the site of a dural graft 13 years after total removal of a benign meningioma-case report. (1998) Neurol Med Chir(Tokyo) 38(11):733-737. 6. Rutkowski, M.J., Sughrue, M.E., Kane, A.J., et al. Predictors of mortality following treatment of intracranial hemangiopericytoma. (2010) J Neurosurg 113(2): 333-339. 7. Rutkowski MJ, Jian BJ, Bloch O, et al. Intracranial hemangiopericytoma: clinical experience and treatment considerations in a modern series of 40 adult patients. Cancer. 2012;118:1628–1636. 8. Stessin, A.M., Sison, C., Nieto, J., et al. The role of postoperative radiation therapy in the treatment of meningeal hemangiopericytoma: experience from the SEER database. (2013) Int J Radiat Oncol Biol Phys 85: 784–790. 9. Ghia, A.J., Chang, E.L., Allen, P.K., et al. Intracranial hemangiopericytoma: patterns of failure and the role of radiation therapy. (2013) Neurosurgery 73(4): 624-630. 10. Wei, G., Kang, X., Liu, X., et al. Intracranial meningeal hemangiopericytoma: Recurrences at the initial and distant intracranial sites andextraneural metastases to multiple organs. (2015) Mol Clin Oncol 3(4): 770-774. 11. Tatar, Z., Thivat, E., Planchat, E., et al. Temozolomide and unusual indications: review of literature. (2013) Cancer Treat Rev 39:125–135. 12. Lee, S.J., Kim, S.T., Park, S.H., et al. Successful use of pazopanib for treatment of refractory metastatic hemangiopericytoma. (2014) Clinical Sarcoma Research 4:13.